How long would it take Santa Claus to travel around Europe? You are at: Flights » News » How long would it take Santa Claus to travel around Europe? Christmas is coming fast and as air travel is our great passion, an idea was born. Why don't we give Santa Claus a little help by planning his annual quest? Wonder how long would it take for him to visit all the European capital cities? How many flights does he have to take? Would he spend a fortune and have no money left for gifts? Let's figure it out! As we are based in Europe, we cannot but choose the one and only Santa located in Rovaniemi, Finland. There, at the Arctic Circle, lies the Official Home of Santa Claus. The nearest airport is located just 2 kilometers outside Santa's village. Indeed, he is a smart man to pick such a location. Our Santa is to visit all the capitals of the European Union Member States. Currently, that makes 27 cities. If you have a look at the map of EU, two blank spaces catch your eye. Switzerland and Norway are not members. Of course, we wanted all the children from the EU to receive their presents on time, so we included those countries too. In total, Santa has to visit 29 cities. We pinpointed all of them on a map. Finally, a few interesting numbers. As you know, Santa is visiting 29 different cities. That means he has to take 31 individual flights and change at 30 airports. He would travel 18 192 kilometers before reaching his hometown of Rovaniemi again. Nearly two days will be spent on the plane, 43 hours and 15 minutes to be precise. 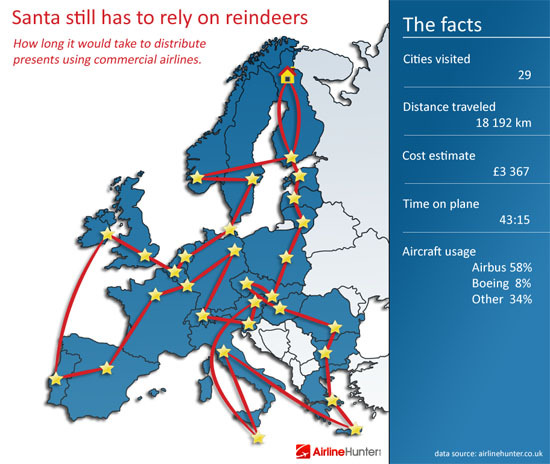 Santa is going to use 17 airlines and 14 types of aircraft. Airbus being the most frequently used plane brand will cover 58% of the journey, while Boeing is going to be used on 8% of the route only. Would Santa Claus spend a fortune? Curious to know the costs of such a trip? We bet you are. Using our advanced flight search engine we estimated the total expense. And the number is: 3 953 EUR. That's quite a lot. But bear in mind the ticket prices have skyrocketed recently due to the upcoming holiday season. Furthermore, our Santa would buy his ticket only a week in advance. Also, low cost airlines couldn't be used on some routes. Do you think there are better options to choose from? You're welcome to share your tips.